China’s rapid growth is placing increasing demands on natural resources in the region but Beijing’s political rise is encouraging the dictatorship to flex its muscles. Control of water, including navigation rights, resource extraction and the exploitation of shared watercourses is at the heart of today’s geopolitical tensions in Asia. China’s recent actions in the South China Sea and Himalayas have given rise to further—and at times violent—conflict over the region’s natural resources. So will water insecurity lead to greater partnership in Asia? Or will it lead to a revival of China’s traditional sense of regional dominance and undercut efforts to build a rules-based approach to growing resource conflicts? On 15 July, a month earlier than scheduled, the China National Petroleum Corporation (CNPC) announced that it was removing its Haiyang Shiyou-981 oil rig—40 storeys high and worth an estimated $1 billion—from waters close to the Paracel Islands which Vietnam claims fall inside its exclusive economic zone. There were four possible explanations. The first was the one the CNPC offered: the rig had completed its work early. The second was the approach of Typhoon Rammasun, signalling an early start to the region’s storm season. A third was that the US-China Strategic Dialogue the previous week had put pressure on China to lower the temperature in the South China Sea and China had taken the opportunity to demonstrate that it was a responsible international player. The fourth interpretation was that the rig had accomplished its purpose—not prospecting for hydrocarbons but promoting a steady advance of Chinese claims on the South China Sea through a series of assertive steps, none so provocative as to bring in outside players. With each little step, this story goes, China is building its case for singular rights to navigation and resource extraction there. The other players on the regional chessboard—the Philippines, Vietnam, Brunei, Taiwan, Indonesia and Malaysia—have grown increasingly agitated. With the memory of violent clashes between Vietnam and China over the Paracel Islands in 1974 and 1988, the installation of the oil rig in May provoked outbreaks of violence in Vietnam against Chinese citizens and businesses. Vietnamese fishing boats and Chinese ships harassed each other throughout the drilling. It is a dangerous ploy, but China calculates that the dangers are containable. If ethnic Chinese or Chinese citizens suffer harm in the backlash, the host country is to blame. If two ships collide in the course of the hazardous games of “chicken” that have become routine in this contest, Chinese citizens can be mobilised to shout their indignation against the “aggressor”. The waters to which China lays claim are divided under the United Nations Convention on the Law of the Sea (UNCLOS) into exclusive economic zones for Brunei, Indonesia, Malaysia and Taiwan, each of which argues it has been adversely affected by China’s oil rig and claims of sovereignty. The zones, running 200 nautical miles into the South China Sea, allow these states special rights of exploration and exploitation of marine resources in specific areas. The sea is a major shipping route and fishing area, accounting for around one-tenth of the global fish catch and believed to have substantial untapped natural resources. Notably, China’s claims (outlined in a map in 1947) overlap a large portion of these zones. 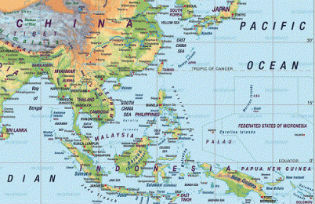 Malaysia also lays claim to a small number of islands in the Spratlys archipelago. With such a concentration of multifaceted and overlapping claims, China’s oil-rig foray heightened tensions and raised fears. In an attempt to settle its resource conflict with China peacefully , the Philippines has filed a case before the UN Permanent Court of Arbitration in The Hague on its own exclusive economic zone. However, even if, as Manila expects, the court rules in its favour, China will ignore this—preferring to use its superior weight in bilateral negotiations rather than submit to third-party or multilateral processes where it is the rules that count. Diplomatic efforts by the Philippines to co-ordinate other claimants to take a common position vis-à-vis China have so far met little success. China’s behaviour has made its smaller neighbours, including Vietnam, reach out to the US for reassurance. But what can it really offer? For the US, the fading Pacific power, the disputes in the South and East China Sea pose a particular dilemma. In the East China Sea, China and Japan have overlapping territorial claims, including to the Diaoyu/Senkaku Islands which Japan controls and does not recognise as contested. The US has maintained neutrality on the islands but has a treaty commitment to defend Japan as the quid pro quo for its post-war pacifism. China might be uncertain about the depth of US enthusiasm for that commitment today but limits its provocation, nevertheless, to such moves as the declaration in November 2013, without consultation, of an “air defence identification zone” which covers territory claimed by its neighbours. International flights are now required to report their identity and flight plans to China when crossing the zone, at risk of “defensive emergency measures”. The strengths and limitations of the US position were clear in May, at the Shangri-La Dialogue in Singapore, the region’s annual multilateral “track two” security summit, where the US retains the power to mobilise a chorus of allies to uphold rules and laws and to criticise China’s behaviour. A series of speakers, including the Japanese prime minister, Shinzo Abe, and the US defence secretary, Chuck Hagel, condemned the use of muscle to enforce claims to the China seas, calling instead for freedom of navigation and overflight and a system based on international rules. General Wang Guanzhong, leader of the Chinese delegation, accused the US and Japan of ganging up on China. He was not sufficiently moved to answer pertinent questions on the rules of engagement for Chinese patrol vessels in the East China Sea, but he did make it clear that China saw no place for the US in 21st-century Asia. China is by far the largest trading partner of all the ASEAN members, which are caught in the small-neighbour dilemma, somewhere between the fear that China will come to rule their lives and consume their resources and the fear of giving offence to the region’s most important economic power. For them, the game is to try to stay on good terms with both sides. The dilemma is also evident among a different set of China’s neighbours—those that depend on the rivers that rise in the mountains and on the high plateau of Tibet. China’s largest downstream neighbour is, of course, India. India-China relations are bedevilled by unsettled borders-status rivalries, the subject of relatively recent skirmishes, but their most intractable potential conflict is over the shared resource of the Himalayan watershed. In its eagerness to promote new Asian alliances, Beijing dispatched the foreign minister, Wang Yi, to Delhi in June, to reach out early to the administration of the newly-elected Narendra Modi. Wang presented himself as the personal envoy of China’s president, Xi Jinping, and startled the Indian press by claiming that the two countries were ready to settle their long-running border dispute. The announcement was however short on detail—and, since the Indian state of Arunachal Pradesh is claimed by China while China’s Aksai Chin is claimed by India, details matter. There has been no further hint of an imminent deal but India, like all of China’s downstream neighbours, is more concerned by the impact Chinese activities are having on the quality and quantity of water that crosses its borders than the exact position of the borders themselves. The Himalayan cryosphere contains the largest store of fresh water outside the two polar regions and is a significant influence on the region’s climate, including its monsoons. As in the polar regions, rising temperatures are affecting the glaciers and snow fields that give birth to Asia’s rivers and future impacts on monsoons, though hard to predict, are highly likely. In the shorter term, China’s expansion of development westward is affecting the Qinghai Tibet plateau and everything that flows from it. Increased mineral extraction in Tibet and a renewed frenzy of big-hydro construction on trans-boundary rivers are changing Asia’s water flows for ever. There is increasing awareness of the risk of the downstream disasters that could result from building mega-dams in one of the world’s most active earthquake zones. There are no trans-boundary agreements between China and any lower riparian country on the shared use of Asia’s great rivers, even though 1.6 billion people depend on them and China is building dams on all their head waters. For India, dams and threatened water diversions on the Brahmaputra are a particular concern. For the countries of the Mekong, China’s dam-building upstream poses a series of potential dangers. Meanwhile, India and others are running to catch up in the dam race, fearful of allowing de facto rights to be created unchallenged. There has been no source-to-sink assessment of the impact on river ecosystems of any single dam—let alone of the massive cascades planned or under construction—and there are no mechanisms for resolving disputes. China has refused to enter into discussions with lower riparian countries, beyond agreeing to share limited water-flow data with India. But, as in the South China Sea, limited bilateral discussions are not enough to ensure that the ecosystems of the watershed are protected and the legitimate interests of all those whose livelihoods depend on the rivers are recognised. From the high Himalaya to the teeming deltas, life will be affected. If ever there was a case for clear rules and co-operation, it can be found in the South China Sea and the Himalayan watershed. Both raise the essential question of whether the region’s resource conflicts will be settled by arbitration and law or by force. China’s challenge to US influence is also a challenge to an international order that values arbitration as a way of defending the weak against abuse by the strong. Isabel Hilton is the editor of chinadialogue.net, and was editor of openDemocracy from March 2005-July 2007. She is a journalist, broadcaster, writer and commentator.